I know, I know. I've been radio silence for a long time. Again. I have had major computer issues, dear reader(s). Work blocks blogspot, so I had to blog at home. But I couldn't get my pictures on my Mac b/c the camera cord doesn't work. Then, work UNblocked blogspot for, like, five minutes but did block Flickr. It was a perfect storm of stupid computers. 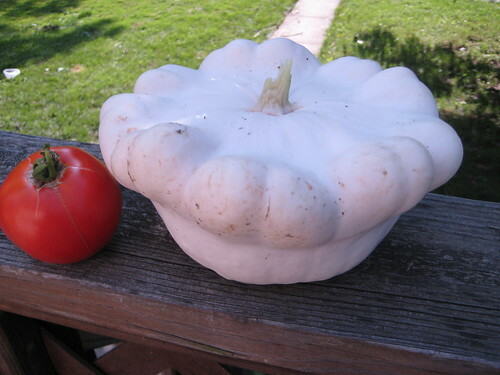 I bought the seeds from RareSeeds.com, which says they are a white scallop, "A very ancient native American heirloom squash, grown by the Northern Indians for hundreds of years, this type was depicted by Europeans back to 1591, and one of the best tasting and yielding varieties still around today!" They were not kidding. I got about five zukes out of my zucchini plants, one creepy looking cuke, a smattering of tomatoes but a metric TON of these. There are about a dozen STILL on the plant right now. I have no idea how to cook them, either! They didn't seem to bake up well, and they look pretty bland and smell like pumpkin. Maybe I can carve them for Halloween? ?